Jones Point – Chesapeake Chapter U.S.L.H.S. 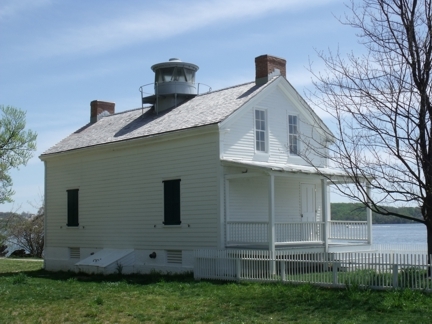 In 1852 Congress approved $5,000 to acquire land and build a small lighthouse at Jones Point on the Potomac River just south of the city of Alexandra, Virginia. The land was purchased from the Manassas Gap Rail Road in 1855. The light was first lit on May 3, 1856. The builder of the light was Charles Church. In 1858 the light in the 5th-order Fresnel lens was converted from oil to piped in gas from the Alexandria Gas Works. Problems with the gas lines caused the fuel supply to be converted to Mineral Oil (kerosene) in 1900. At the same time the fixed white light was changed to a fixed red light. In 1919 changes were again made to the station. Because of landfill operations, the light needed to be moved closer to the point. This time a 200-candlepower flashing acetylene light was set up about 300 feet to the east of the lighthouse. In 1926 a new skeletal steel tower was built on the new landfill at the tip of the point. This light was a fixed green light. 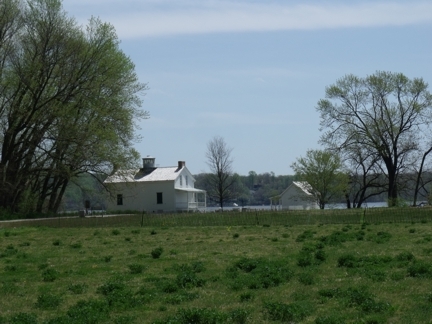 At the same time, the lighthouse was declared surplus and turned over to the Mount Vernon Chapter of the Daughters of the American Revolution. The DAR then did a complete restoration of the dwelling and the light and installed a live in caretaker to watch out for the property. The caretaker, Mrs. McMahan, kept the lighthouse open to the public for tours. In 1934 the light on the skeletal steel tower was converted to electric power and automated. This light was discontinued in November of 1962 when the new Woodrow Wilson Bridge, part of the Capital Beltway, was opened and the lights on the bridge provided a better source for guidance of shipping. In 1936 the Army Signal Corps, who owned the land surrounding the light, erected a chain link fence around their operations, cutting off access to the lighthouse for Mrs. McMahan. The lighthouse remained in the hands of the Signal Corps until after WWII when it was returned to the DAR. Its condition upon return was depressing. Siding was missing, leaks had not been repaired, the house had been used for target practice, etc. Because of money problems, in the early 1960’s, the DAR approached the National Park Service about establishing a park on the 3000 square feet of land around the lighthouse. One of the conditions being that the light would be restored and the land turned into a park. The Park Service accepted this arrangement and the land was deeded to the Park Service. The land of the Army Signal Corps was also deeded to the Park Service creating a 50-acre park. In the 1980’s, the Park Service tried to sell off the property to real estate developers but were stopped by a loud outcry from the City of Alexandria, the DAR and other local interests. In 1986 an agreement was finally signed to with Park Service to restore the lighthouse as a museum. At the present time, the exterior of the building has been restored but there is nothing on the inside, not even flooring on the first floor. About 1990, vandals set fire to the lighthouse but the fire was extinguished without too much damage. The young men were caught and prosecuted and the damage was repaired. The park is open during daylight hours and is well worth the trip even if you can not get inside the light. Also while there, look for one of the original boundary stones of the “Territory of Columbia” that was set on April 15th of 1791. This stone marks the southern tip of the current District of Columbia. From I-95/495 in Alexandria, take Exit 1 for Route 1 North. Turn right on Franklin Street. Then turn right on S. Royal Street. Turn left on Jones Point Road. Partway down this road, turn right under the Woodrow Wilson Bridge. The road ends at the parking lot. Photos taken April 14, 2013 by A. Pasek.